Technologies such as anti-virus and firewalls are not enough to protect midsized businesses and public organizations from downtime and losses due to today’s cyberthreats. Organizations need advanced security technology, strong security expertise and 24x7 vigilance to safeguard their networks and IT systems. 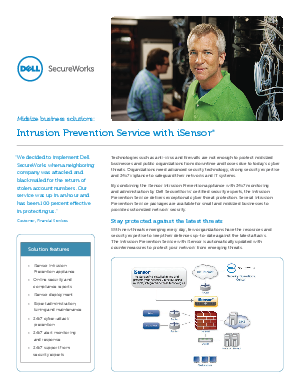 Read this whitepaper to understand how combining the iSensor Intrusion Prevention appliance with 24x7 monitoring and administration by Dell SecureWorks’ certified security experts to deliver exceptional cyber threat protection for your midsize organization.